Rich and luxurious, our elephant is crafted from poly resin and beautifully hand painted in a rich gold finish. The elephant is adorned with a detailed carpet on his back and a headpiece in an exotic east Asian design. Clear rhinestones on the front add an additional sparkle to highlight your picture. The back of the elephant has black kraft paper and a hinged opening to allow easy placement of a photo or to fill in the blank placecard which is included. A raised trunk signifies good luck! 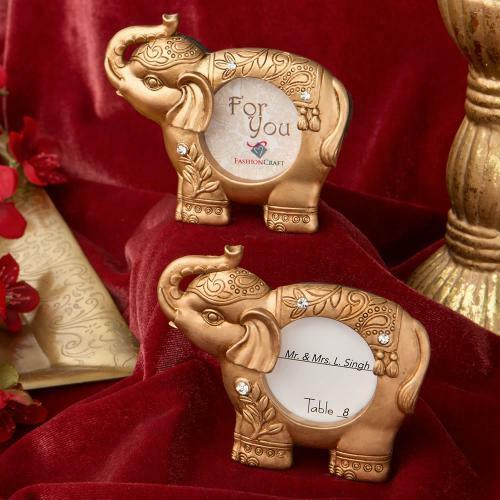 Bring good luck and a luxurious touch to your event tables with these stunning elephants. Size is 3 1/2" x 2 3/4"
Round picture size 1 1/2"